Use Articulate Storyline's freeform text-entry question to create your own fill-in-the-blank assessments. Tip: You can add multiple text-entry fields to a single slide, but only one can be evaluated. If you need to evaluate more than one text-entry field on the same slide, consider this method instead. Click the Freeform tab at the top of the window and select Text Entry. A new text-entry question will open in Slide View, and a text-entry field will automatically be added for you. Switch to Form View and proceed to the next step to define acceptable answers for the text-entry field. By default, text-entry questions are graded assessments. Switch to Form View and type the acceptable answers for the text-entry field in the answer grid. If the acceptable answers are case-sensitive, mark the Answers are case sensitive box above the grid. Tip: If you convert an existing slide with data-entry fields into a freeform text-entry question, use the Field to evaluate drop-down to identify the field you want to evaluate. Only one field per slide can be evaluated. If you've added your own custom button or hotspot to the slide that you'd like to use to submit the question, select it from the Submit Button drop-down. Use the Submit Keys field below the answer grid to designate a keystroke or combination of keystrokes that will submit the learner's answer for evaluation. Just click in the Submit Keys field and press the key or combination of keys you want to use. If you change your mind, you can either press the correct key(s), which will update the Submit Keys field, or click the X button to clear the field altogether. Tip: The Enter key always submits a text-entry field for evaluation, so you don't need to define it here. 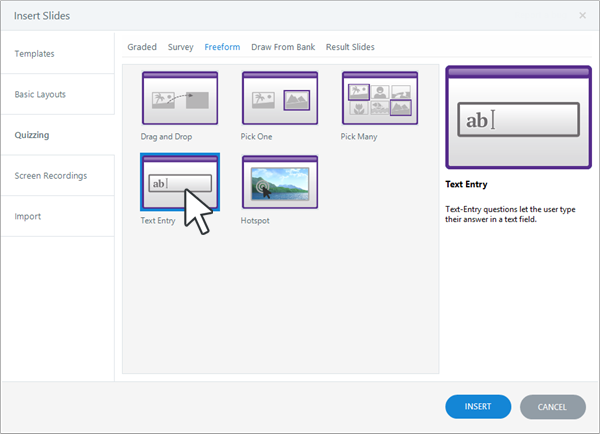 After creating a freeform text-entry question, you can customize several of its attributes, including feedback, branching, score, number of attempts, and whether learners are required to answer it or allowed to skip it. To learn how, see Working with the Question Editor.